Spontaneous and rapid tanning of the skin, but does not last very long. The skin does not build up a protective layer. Stronger than UV-A, responsible for the natural sunscreen of the skin. The skin callous thickens and the self-protection of the skin is increased by a factor of 5. As a second protective mechanism, melanin is increasingly produced, which accumulates in the skin surface. The more that is stored, the more tan one gets. If the high-energy UVC rays hit the unprotected skin, severe burns can occur within a short time. UV rays are high-energy electromagnetic rays that occur in the natural spectrum of the radiation emitted by the sun. UVC disinfection is a purely physical process that mimics the same natural occurring process from the sun. The principal disinfecting effect of ultraviolet (UVC) rays on microorganisms is based on the action of the high-energy UVC light with the peak being achieved at a wavelength of 254 nm (nanometers). 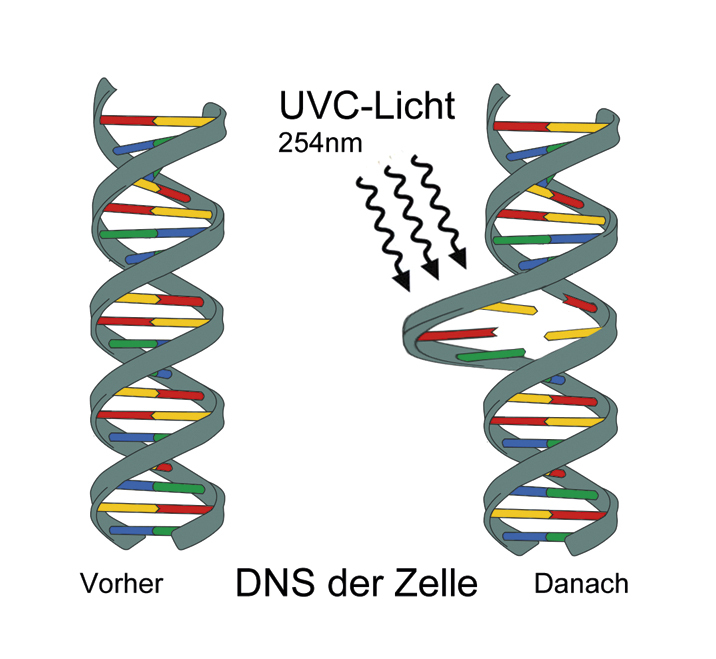 The DNA (genetic information carriers) of the microorganisms, bacteria and viruses present in the water are damaged by the high energy of the UVC radiation, which effectively inactivates the microorganisms. UVC light thus inactivates disease-causing microorganisms within seconds and prevents their further reproduction and multiplication. Drinking water was first disinfected using UVC irradiation as far back as 100 years ago. However, this process was displaced by chlorination due to chlorination being much cheaper. Chlorine was therefore the most important disinfection method for decades. However, the discovery of the formation of organohalogen compounds and other DBPs(Disinfection by Producst) associated with chlorination in the presence of organic water constituents, has led to a decreasing public acceptance of chemicals in the food chain, and pushed the search for an alternative disinfection method. This led back to UV-C disinfection. The disinfection of drinking water using ultraviolet light in the UVC range comes closest, of all disinfection methods, to meeting the requirements for disinfecting untreated water, especially since it does not change the natural taste and the mineral composition of the water. The most effective wavelength for inactivating microorganisms is achieved with UV-C light of 254 nm. The plotted line is the cell deactivation as a function of the specific wavelength. In the spectral line of 254 nm, the activity curve of inactivation of cells and viruses is at its peak. The effect of UV light on microorganisms is due to the high-energy of UVC light. The DNA (deoxyribonucleic acid = genetic information carrier) of the bacteria and viruses present in the water are damaged by the UV-C rays. The light penetrates through the cell wall into the microorganism and causes a reaction with the DNA of the cell, breaking up the carbon bonds within the DNA strands. This occurs in a matter of seconds, leading to the inactivatation of the microorganisms. This disrupts the metabolism of the cell as well as its reproduction capabilities.